Wikidata celebrated its sixth birthday on Monday, with celebrations, “data-thons” and cake around the world. Things move quickly in the world of Wikidata, so it’s time for a sequel to my round-up from earlier this year. Four of them are my own creations, including Collection Explorer and Astrolabe Explorer. One that I hadn’t heard of was JSTOR’s Cultural History Baseball Cards. This application uses Wikidata to create profile pages for key people in the history of baseball, bringing in key facts and dates, and linking to images and articles about that person. The Smithsonian are partners in a project developing tools and processes to capture what is depicted in works of art, using Wikidata identifiers (“Q numbers”). Wikidata already makes it possible to add depiction statements, and there are already hundreds of such properties added to items in the Bodleian, the Ashmolean and the Pitt Rivers Museum. The Smithsonian/ Wikimedia DC project is looking at extracting entities from catalogue descriptions and other textual descriptions. Structuring the metadata of cultural heritage objects as Linked Data brings a lot of potential benefits: it can increase the findability of your objects, allows for multilingual searches for the same term and automatic translations, and the addition of more information on an object from other sources, to name a few. On Wikmedia Commons, Wikidata is increasingly being used to supply data about the items depicted in images. For example, the infoboxes that accompany some scans of Bodleian manuscripts on Commons are maintained by drawing in data from Wikidata (example on the right). 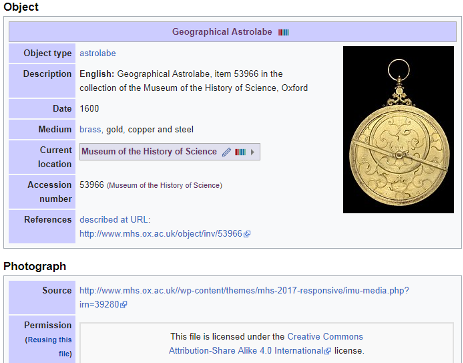 Another example is the recent sharing of images and catalogue data about astrolabes from the Museum of the History of Science. The data about the objects themselves (and their host institution) are kept on Wikidata, separate from data about the photographs. Maintaining data about collection items in one place and sharing it doesn’t just prevent duplication of work. 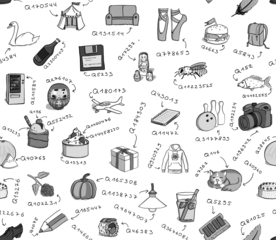 It gives users context for the images they find online, including shelfmarks and links to catalogue records, and as we are seeing, enables an increasingly inventive and diverse set of applications and interfaces.